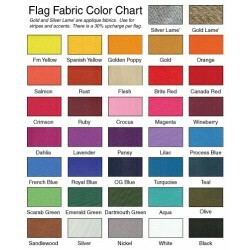 Please choose the colors you would like from the color chart and type the colors in the field below. Next, tell us how you are going to hang your flags from the drop down menu. The regular way is with standard heading and grommets and no extra charge. The other option is for pole sleeve on the side. The upcharge is shown by each option. Learn more about all of the colored flags we have in our complete flag catalogue. Click here to flip through the book.